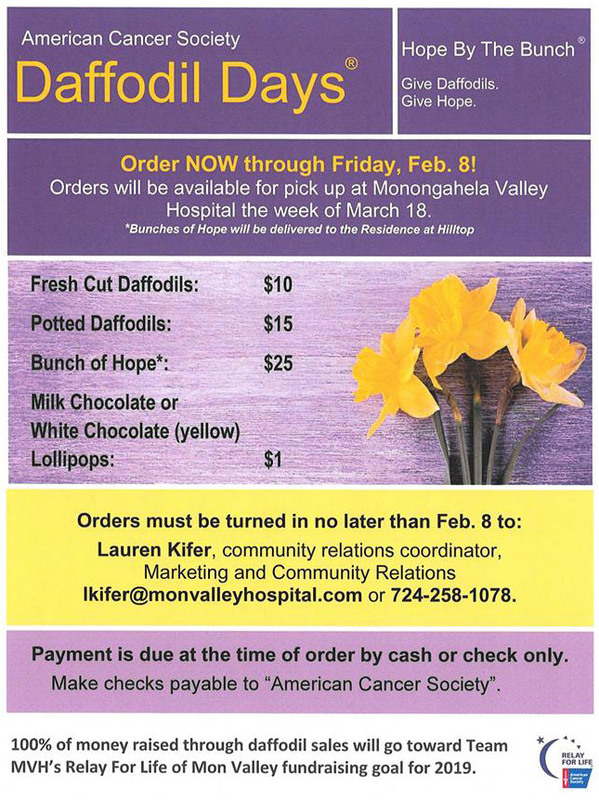 Monongahela Valley Hospital Daffodil Days Flyer. Click here to enlarge. The daffodil is the first flower of spring and a symbol of hope. 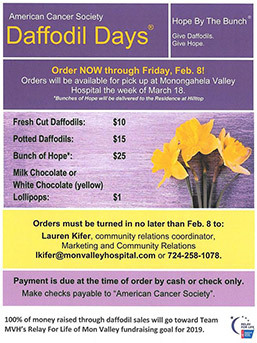 In association with the American Cancer Society's Daffodil Days, Monongahela Valley Hospital (MVH) is selling daffodils to raise money for Team MVH's Relay for Life of Mon Valley 2019 fundraising goals. Celebrating Daffodil Days is about much more than enjoying beautiful flowers; it's about sharing hope for a world free from cancer. Your contributions to Daffodil Days helps people stay well and get well by finding cures and fighting back against cancer. Daffodils can be ordered now through Friday, Feb. 8. Orders will be available for pick up the week of March 18. Patients staying at MVH receive a daffodil on their meal tray and Bunches of Hope are delivered to the Residence at Hilltop. For more information, contact Lauren Kifer, community relations coordinator at lkifer@monvalleyhospital.com or call 724-258-1078.